Although some dog owners keep their dogs in kennels, our dogs are considered part of our family and therefore they live in our home. We wouldn’t have it any other way. As a result, we have developed a deep bond with our Gordon Setters and they with us. The Gordon is a very intelligent animal, quick to learn and they definitely have their own individual personalities. Gordons are “talkers”, readily telling you what they are thinking and quick to display their love and affection in exchange for the same. Excellent family dogs, they have a special affection for children and are protective of them. The Gordon enjoys being part of the family and wants to take part in all family activities. Our lives have certainly become more enriched with the addition of our Gordon Setters into our family. 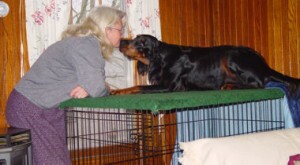 Our first Gordon Setter was McRoth Jazzy Wee Lass (Jazzy), who was born December 13, 2003. Ray drove to Maryland to purchase her from the McRoth Kennels. She was a loving, happy puppy and rode next to Ray on the way to her new home in West Virginia; she even “talked” when she had to go to the bathroom so Ray could stop in time for her. On the first night at her new home in West Virginia, Jazzy slept next to Ray, safe, sound and contented. She has been an affectionate and loyal member of our family. Jazzy bonded closely with our family and it wasn’t long until we decided to get another Gordon Setter. Pets seem to be happier if they have another of their species that they can play and romp with. Our second Gordon Setter was Tandera’s Hi Ride’n Lass (Heidi), who was born January 7, 2005. Ray drove to Georgia to purchase her from the Tandera Kennels. As happened in the trip bringing Jazzy home, Heidi rode next to Ray on the way to her new home in West Virginia and Heidi, likewise, “talked” when she had to go to the bathroom so Ray could stop in time for her. Gordons really are very intelligent animals and quick learning. Jazzy adapted to Heidi right away, even allowing this new puppy to sleep against her. Our Gordon Setters love to go with us when we drive to town, especially when the weather is warm enough to have the windows down so they can sniff the air as we drive along. Jazzy and Heidi have adopted readily to our shopping trips, waiting patiently in the vehicle until we return. During warm weather, we never leave them alone in the vehicle because of possible heat buildup in the vehicle. Of course, what trip to town would be complete without a stop at either McDonalds or Burger King to buy a plain cheeseburger as a treat for Jazzy and Heidi? And you can bet they recognize the restaurant buildings when we get close to them. C’mon now, admit it, we bet you take your dogs out for a treat now and then, too, don’t you? Our Gordon Setters will go to the door and sit as a signal to us that they need to take care of their personal business outside. If we don’t notice them sitting at the door, waiting to go outside, they will scratch at the door to get our attention. When one Gordon goes outside, the other Gordon always accompanies them. Well, it didn’t take the Gordons long to figure out how to get what they want. If Heidi was laying in Jazzy’s favorite spot, or vice versa, then Jazzy would go to the door and scratch to be let outside. When we would open the door, Heidi would jump up and run outside thinking she was going outside with Jazzy; however, Jazzy, instead of running outside, would instead run over and lay down in her favorite spot that Heidi had been laying in. Smart dogs! Gordon Setters are a long haired breed, with a long feathered coat and moderate shedding. Subsequently, Gordons need brushing about twice a week and more often if they are being groomed for shows. Jazzy and Heidi have their own preferences when it comes to grooming and cleaning. Jazzy tolerates being groomed but Heidi loves to be groomed. When it’s bath time, Jazzy will stand while being bathed and not move until being told it was ok to leave; Heidi will stand while being bathed but will leave if she thinks you are finished with her even though you haven’t told her it was ok to leave. Both Jazzy and Heidi love being petted, rubbed and scratched. The following is a passage from the book “The Old Man’s Boy Grows Older” by Robert Ruark.